For other uses, see The King's Academy (disambiguation). The King's Academy is a National Blue Ribbon, college-preparatory, Christian preschool, elementary, and secondary school located in West Palm Beach, Florida. The school serves families with students from age one to twelfth grade on campuses located in Palm Beach County. Established in 1970, it is run by an independent board of governors. The King's Academy was founded by a group of Christian business leaders in August 1970 and opened on the campus of Belvedere Baptist Church in West Palm Beach, Florida. In 1971, the school purchased a 20-acre campus on Cherry Road where it remained until the 2004 school year. In August 2005, The King's Academy moved to its current 60 acre location at Belvedere Road and Sansbury's Way in Palm Beach County, Florida. In 2010, the school opened a second high school location on Caribbean Avenue in Clewiston, Florida. In 2017, this high school was sold to Clewiston Christian School. Since 1970, four presidents have overseen the day-to-day operations of the school: Kye Harris (1970–74), M. Nelson Loveland (1974–99), Jeffrey M. Loveland (1999–2016), and Randal L. Martin (2016–present). Since the school's inception, six chairs of the board of governors have served: M. Nelson Loveland (1970–74), Lloyd Prouty (1974-75), Stanley F. Frederick (1975–87), Gene Martin (1987–93), David Fiebig (1993-2006), and Clyde S. Meckstroth (2006–present). 1986: The school received national recognition for excellence in education from President Ronald Reagan and U.S. Secretary of Education William Bennett as one of the top 60 private schools in the country. 1988: The band performed at the White House during President Ronald Reagan's term. 1989: On January 20th, the school's band students were selected to play for President George H.W. Bush and Vice President Dan Quayle at their inaugural parade. 2000: The school's fine arts students performed the world amateur premiere of Disney's Beauty and the Beast. 2007: Christian school researcher Dr. Gene Frost cited the school as one of the seven best Christian schools in America in his book, Learning from the Best: Growing Greatness in the Christian School. 2013: The school's fine arts students performed the world premiere of Disney's The Hunchback of Notre Dame (an English adaptation of the German-language musical Der Glöckner von Notre Dame). 2014: Dr. Frost reiterated the school's top seven national ranking. 2014: Arne Duncan, U.S. Secretary of Education for President Barack Obama, named the school a National Blue Ribbon School as an Exemplary High Performing School; one of 50 private schools to receive the honor. 2015: The National Football League named the school to its Super Bowl High School Honor Roll. 2016: The school's musical theatre program was named one of the nation's five best by the American High School Theatre Festival, winning the award for its performance of "Jekyll & Hyde." 2016: The school's boys golf team won a national championship at the Antigua National High School Golf Invitational in Scottsdale, Arizona; defeating the Utah state champion team by 11 strokes, the Arizona champion by 15 strokes, and the Illinois winner by 25 strokes. 2017: The school's choir and dance students were selected to perform for President Donald Trump and Vice President Mike Pence at their inaugural concert. 2017: The school's competitive cheerleading team earned National Grand Champion honors, defeating all teams, at the Fellowship of Christian Cheerleaders ("FCC") National Championships in Orlando, Florida. 2017: For a second time, the school's musical theatre program was named one of the nation's five best by the American High School Theatre Festival, winning the award for its performance of "Les Miserables." 2018: The school's competitive cheerleading team earned National Grand Champion honors for a second time, defeating all teams, at the Fellowship of Christian Cheerleaders ("FCC") National Championships in Orlando, Florida. 2019: The school's competitive cheerleading team earned National Grand Champion honors for a third time, defeating all teams, at the Fellowship of Christian Cheerleaders ("FCC") National Championships in Orlando, Florida. The King's Academy was named a 2014 National Blue Ribbon School by the U.S. Dept. of Education. The King's Academy offers a college preparatory program for students from preschool to 12th grade. The King's Academy is fully accredited by four accrediting bodies: Southern Association of Colleges and Schools, AdvancED, the Association of Christian Schools International and the Florida Association of Christian Colleges and Schools. The school's most recent re-accreditation study was completed in 2013 and resulted in an extension of the school's accreditation through 2018. The King's Academy's secondary school educates students from 7th to 12th grade. On average, 99% of The King's Academy's graduates enter college, with 96% of graduates matriculating into a four-year university or college. Other graduates commit to service in the United States military branches. The King's Academy offers 22 Advanced Placement courses and 21 hours of dual enrollment credits in partnership with Palm Beach Atlantic University. In 2017, the school's senior class (121 graduates) received college scholarships worth $7.3 million. Recent graduates of the school have been accepted by selective universities including Harvard University, Yale University, Brown University, Columbia University, Cornell University, Dartmouth College, Princeton University, University of Pennsylvania, Air Force Academy, Duke University, Florida State University, Georgetown University, University of North Carolina, New York University, University of Florida, and Vanderbilt University. In 2013, the school established a business track for high school students. Business-minded students can earn a certificate of completion by taking electives in American entrepreneurship, economics, ethics, foreign language, marketing and statistics; while being a member of Future Business Leaders of America (FBLA-PBL). In 2015, the school established a STEM magnet program for high school and elementary students, offering an academically-rigorous science, technology, engineering and math curriculum. Students that complete the STEM track receive a certificate of completion. In 2017, the school established a sports medicine track for high school students. Students interested in the field of athletic training can earn a certificate of completion by taking five electives in sports medicine-related classes including First Aid & Safety, Care & Prevention of Athletic Injuries, Health Explorations I Honors, Health Explorations II Honors, and Anatomy and Physiology Honors. In 2017, the school established a christian ministry track for high school students. Students interested in a future career in ministry can earn a certificate of completion by enrolling and successfully completing three advanced biblical electives including Interpreting the Bible, Introduction to Christian Ministry, and Evangelism and Apologetics. In 2018, the school established a computer science designation for students in grades nine to twelve. Students inspired to study the subject can complete the courses of Computer Programming, Web Design, and AP Computer Principals in order to receive the distinction. The King's Academy's elementary school educates students from pre-Kindergarten to 6th grade. The school's elementary students’ average scores ranked in the top 15 percent of private schools nationally for 2013 and 2014 academic standardized testing; qualifying the school as a Blue Ribbon Elementary School according to the U.S. Department of Education. As a result, the school was named a 2014 National Blue Ribbon School. In addition to academic subjects, the School's elementary program provides instruction in art, band, cognitive development, Latin, music appreciation, physical education, Spanish, science laboratory, technology and vocal music. Optional after-school extracurricular activities are offered for athletic and fine arts development. The King's Academy Athletic Shield. The King's Academy's Lions athletics program competes in the following sports: Baseball, Basketball, Bowling, Cheerleading, Cross Country, Football, Golf, Lacrosse, Swimming, Soccer, Softball, Tennis, Track & Field, and Volleyball. As a full member of the Florida High School Athletic Association (FHSAA), the school fields approximately 50 boys and girls teams in 23 FHSAA-sanctioned varsity sports. In 2014, The King's Academy joined the independent Southeastern Football Conference for football only. In 1992, The King's Academy's baseball team defeated Tallahassee Maclay for the school's first Florida state championship, and won another state title in 2001. The King's Academy volleyball team won the Florida state title in 1993, in 1994, and again in 2006. The King's Academy competitive cheerleading team won five consecutive FHSAA state championships from 2010 to 2014 and a sixth in 2019. In 2016, The King's Academy's boys' golf team won the school's first national championship at the Antigua National High School Golf Invitational in Scottsdale, Arizona. The school's competitive cheerleading team earned National Grand Champion and FHSAA Public School Champion honors at the 2017 and 2018 FCC National Championships in Orlando, Florida. (*) National title. (**) State runner-up. (^) FCC Division championship. (^^) Southeastern Football Conference championship. The King's Academy's football, soccer and lacrosse teams play home games on campus at Kahlert Stadium, a lighted, natural turf facility with seating for 1,500 fans. Lion and Lady Lion volleyball and basketball teams compete in the M. Nelson Loveland Athletic Center's gymnasium, which houses a game court and two practice courts and has seating for 800 spectators. The School's property also contains lighted baseball and softball fields, a track and field facility with seating for 300, six competition tennis courts and a USATF certified 5-K cross-country course. In 2015, the school built the Full-Page Aquatic Center, comprising a 25-meter competition swimming pool and pool house, for use by its swimming teams. On-campus athletic training facilities include a field house with weight and athletic training rooms, a covered basketball and volleyball pavilion, a golf practice facility, and three prescription athletic turf practice fields (football, multi-purpose and lacrosse). In all, The King's Academy maintains 15 acres of natural turf fields for its athletic program. The King's Academy offers a comprehensive arts education to its preschool through high school students. Students perform in Broadway-style musicals, His People and His Voice choirs, jazz, concert and marching bands, percussion, strings and dance ensembles, visual arts, broadcasting, film and digital arts, and stagecraft. They can also earn diploma distinctions in theatre arts, instrumental arts, vocal arts, dance arts, visual arts, and digital arts. In 2016 and 2017, the school's conservatory program was ranked in the top five schools nationally by the American High School Theatre Festival. Pre-kindergarten through third grade students are taught music theory and receive beginning vocal training. They also participate in basic visual art classes. Students in fourth through eighth grade are given the opportunity to enroll and perform in theatre arts, instrumental arts including piano laboratory, vocal arts and dance arts classes and shows. In April 2013, the school's students performed the world premiere of Disney's The Hunchback of Notre Dame (an English adaptation of the German-language musical Der Glöckner von Notre Dame). This performance was made in collaboration with Walt Disney Executive Studios. After viewing the performance, Disney executive Brian Turwilliger commented, "The story was so beautifully crafted and displayed in new and fresh ways." He explained that Disney will now offer The Hunchback of Notre Dame to be performed at other schools and amateur theaters, as it did with Beauty and the Beast after another Disney-The King's Academy collaboration in 2000 resulted in the world amateur stage premiere of the musical. In 2015, the school's production of The Sound of Music was featured on an episode of ABC News' 20/20. The school's production of Jekyll & Hyde earned a 2016 top high school musical theatre program award from the American High School Theatre Festival and an invitation to perform Les Miserables at the 2017 Fringe Festival in London, England and Edinburgh, Scotland. In 2017, the school earned a second top theatre program award for its productions of "Les Miserables" and "Funny Girl." In 2018, the school premiered the nation's first high school production of Disney's Newsies (the musical). 2018-19 Newsies the Musical,  Our Town (play), Titanic the Musical, Miss Saigon (musical). The King's Academy offers instrumental classes for elementary students starting with beginning band in 5th grade and intermediate band in 6th grade. Secondary students may choose to continue their studies in the school's concert and symphonic bands. The King's Academy also offers classes in woodwinds, percussion and strings. The school's marching and parade band, The King's Regiment (formerly known as the Marching Lions) is a 3-time state runner-up (2008, 2010 and 2012) in Class A at the Florida Marching Band Championships. In 2013, the Marching Lions finished 10th in the nation (Class A) at the Bands of America's Grand National Championships, held at Indianapolis' Lucas Oil Stadium. TKA's Emmanuel Lamur '07, in the NFL since 2012, played linebacker for the Cincinnati Bengals and now plays with the Oakland Raiders. A 2007 graduate of the school, Emmanuel Lamur played linebacker in the National Football League for the Cincinnati Bengals and Minnesota Vikings., and currently plays for the Oakland Raiders. He played college football at Kansas State University. His twin brother Sammuel Lamur '07 also graduated from The King's Academy, played at Kansas State and is a quarterback for the Tampa Bay Storm in the Arena Football League. A 2005 graduate of the school, Tess Soltau studied acting at Carnegie Mellon University, and is a Broadway and television actress. She played Glinda as part of the Broadway company of Wicked and previously starred as Wednesday Addams in the Broadway production of The Addams Family. She has appeared off-Broadway in the world premieres of Sheryl Crow's The Diner, "Romy and Michele's High School Reunion",  as well as in Far From Heaven and Into the Woods. She also guest starred in recurring roles on several television shows including Law & Order: SVU (as Caroline Pereira) and White Collar (as Miranda). Lauren Jelencovich graduated from The King's Academy in 2003 and is a professional soprano singer. While a student at the school, she won the grand prize on Ed McMahon's Star Search television show. After studying vocal performance, opera, and musical theater at the Manhattan School of Music, she has performed around the world at venues such as Carnegie Hall and the MGM Grand Las Vegas and currently tours globally as a lead vocalist with Yanni. Colt Morton graduated from The King's Academy in 2000 and was a Major League Baseball catcher for the San Diego Padres. He played college baseball at North Carolina State University. A 2008 graduate of the school, Sam Tanabe studied musical theater and dance at Point Park University, and is a Broadway actor. He played Sammy as part of the Broadway company of Allegiance. A 1988 graduate of the school, Dr. Juli Slattery is a clinical psychologist and broadcast media professional. She was co-host of the nationally syndicated Focus on the Family daily radio broadcast with Jim Daly from 2010 to 2012 and is President of the non-profit organization, Authentic Intimacy. She has also authored books including Finding the Hero In Your Husband, No More Headaches, Beyond the Masquerade and Guilt Free Motherhood, and is a regular contributor to Today's Christian Woman magazine. Gary Wallace graduated from The King's Academy in 1986, studied at the University of Central Florida and hosts a nationally syndicated morning radio show, as Wally on "The Wally Show". His show is heard on over 100 radio stations nationwide on the WAY-FM Christian radio network. Previously, Wally was the host of a nationally syndicated contemporary Christian music radio program, Total Axxess. Wally delivered the commencement address at the school's 2014 graduation ceremony. A 1989 graduate of the school, Dr. Karl Shoemaker is an author and professor of legal history at the University of Wisconsin–Madison. After playing professional baseball in Italy, he earned a J.D. degree from Samford University and a Ph.D. from the University of California, Berkeley. His book, Sanctuary and Crime in the Middle Ages, won the John Nicholas Brown Prize of the Medieval Academy; and he has appeared on C-SPAN to debate the merits of unionized workers. Dr. Elizabeth Ennis graduated from The King's Academy in 1979. She received her M.D. from the University of South Alabama in 1989 and completed an internship in Internal Medicine at the University of Alabama at Birmingham, where she also completed her residency and a fellowship in Diabetes, Endocrinology and Metabolism. Dr. Ennis is Chief Medical Officer and Vice President, Medical Education & Research for Baptist Health System of Alabama, a nonprofit group of 43 hospitals and clinics. She is board certified in internal medicine and endocrinology and also maintains a private practice focused on thryroid and pituitary disorders. She has been recognized as one of the Best Doctors in America. A 2000 graduate of the school, Sgt. Philip Jones studied instrumental music at Southern Methodist University and travels globally as second baritone section leader for the United States Marine Drum and Bugle Corps, also known as "The Commandant's Own". Kent Annan graduated from The King's Academy in 1990 and is a Christian missionary, author and co-founder of the educational non-profit Haiti Partners with Tony Campolo. A graduate of Princeton University, he has authored books including Following Jesus Through the Eye of the Needle and After Shock: Searching for Honest Faith When Your World is Shaken, and has been a contributor to The Huffington Post, Christianity Today, and CNN.com. He has also appeared on national TV and radio in support of Haitian relief efforts on The Hour, 100 Huntley Street, and National Public Radio's The Story. A 2000 graduate of the school, Matthew Wensing studied humanities at the University of Chicago. A software developer, he created Stormpulse.com; a hurricane forecasting and weather intelligence tool used by Fortune 500 companies, the White House situation room, and 6.5 million private users annually. Wensing is CEO of Riskpulse, an Austin, Texas-based emerging risk management firm. Rachel Rossin graduated from The King's Academy in 2005. She studied graphic design and art history at Florida State University, where she also founded The Greenhouse Project to benefit Uganda's Greenhouse Orphanage. She is a multimedia artist who works in oil painting, installation, and digital programming (CAD and virtual reality). Rossin is a virtual reality fellow in residence at New Inc., New Museum's art incubator. Recent solo exhibits of her work have been held at Elliott Levenglick Gallery, New York; Signal, Brooklyn; Spring/Break Art Show, New York; Schoolhouse Projects with Ideas City, New York; and the Cummer Museum of Art and Gardens, Jacksonville, Florida. Her virtual reality work was reviewed in the New York Times. Emin Toro, is an American Lawyer and a nominee to be a U.S. Tax Court Judge. After graduating from King's in '93, he went to the honors program at Palm Beach Atlantic University and then to law school at the University of North Carolina. Following law school, Toro clerked for Judge Karen L. Henderson of the United States Court of Appeals for the District of Columbia Circuit and Associate Justice Clarence Thomas of the Supreme Court of the United States. Toro is a Fellow of the American College of Tax Counsel. He currently is a partner at Covington & Burling. A 2010 graduate of the school, Christina Alessi plays professional volleyball for the Super Liga volleyball club in the Philippines and previously played for the Halmstad Volley Club in Sweden, where she was a national finalist. She played college volleyball for Palm Beach Atlantic University. Dr. Dominique Musselman graduated from The King's Academy in 1980 and is Associate Professor of Psychiatry at the University of Miami. She previously served on the faculty at Emory University. Dr. Musselman researches the pathophysiology of cytokine-induced neurobehavioral symptom complexes suffered by patients with cancer. Her work has been published in the scientific journal Neuropsychopharmacology. D.J. Carter graduated from The King's Academy in 2003 and is Assistant Director for the television show The Middle. He holds a master's degree in Television and Film Production from Loyola Marymount University where he joined the Directors Guild of America Assistant Director Training Program. He has also worked on shows including Silicon Valley, The Mentalist, Transparent, Castle and Brooklyn Nine-Nine. A 2006 graduate of the school and Hall of Fame member Danielle (Bradley) Dingman is a 3-time American National Duathlon Champion. She was an iconic runner for the school, breaking six FHSAA State Championships from 2003 to 2006 in the 800 meter run and 4x800 meter relay events. In 2017, she won two national titles in a single day at the USA Triathlon's 2017 Duathlon Nationals in Bend, Oregon. She also earned the reigning long-course national champion with a time of 2:23.02. . In September 2018, she competed in her first Ironman 70.3 World Championship in South Africa, and finished 19th. Keith Allen is a pre-engineering and mathematics teacher at the school. He also is The King's Academy's head football coach. Previously, Mr. Allen coached college football at Oklahoma, Texas Christian, San Jose State, and was head football coach at Southwest Baptist University for six seasons, still holding the school record for most wins. At King's he led the team to back-to-back South Florida Conference Championships in 2016 and 2017. In 2016, he received the Florida Dairy Farmers' Football Coach of the Year award for independent schools. Jennifer Arrington is a science teacher at the school and holds a master's degree in nutrition and immunology from Texas A&M. Mrs. Arrington is also the author of Trusting for Tomorrow, a book about coping with celiac disease. David Snyder is the director of performing arts at the school. Mr. Snyder holds a master's degree in musical theatre from Ithaca College and performance certificate from Juilliard. Previously, Mr. Snyder performed on Broadway as resident piano accompanist and assistant music director for the Tony-nominated Cabaret, A View From the Bridge, and 1776. He was also a member of the Disney Production Team and the Broadway cast of Beauty and the Beast. Mr. Snyder has also won the Outstanding Teacher of the Year award from the National Thespian Association of Education. Brad Wilkerson is the school's varsity baseball coach. Previously, Mr. Wilkerson was a Major League Baseball outfielder and first baseman with the Montreal Expos, Texas Rangers, Seattle Mariners, and Toronto Blue Jays. He was named 2002 MLB Rookie of the Year by the Sporting News and won an Olympic gold medal for USA Baseball at the 2000 Sydney games. Mr. Wilkerson played college baseball at the University of Florida and was inducted into the National College Baseball Hall of Fame in 2012. In 2014, he was named National Volunteer Coach of the Year by USA Baseball. Linda Moskeland Fuchs, wife of University of Florida president W. Kent Fuchs, taught French, yearbook and elementary art at the school in 1977 and 1978. Mrs. Fuchs subsequently became an art historian and holds master's degrees in art history from the University of Chicago and Cornell and a master's degree in Biblical studies from Trinity Evangelical Divinity School. Jonathan Martin was a physical education and athletic training teacher at the school, holding a degree from the University of South Carolina. Mr. Martin played college football as a safety for South Carolina and played professionally for the Dallas Cowboys and in Italy. He also coached college football at the University of Kentucky. William H. Vimont was the school's founding headmaster in 1970. Mr. Vimont coauthored the Victory Drill Book, a systematic approach to high speed phonetic reading. This book of speed reading drills was used at The King's Academy during the 1970s and 1980s and is still in print. Jennifer Winters was a broadcasting, acting and vocal arts teacher at the school. Previously, Mrs. Winters performed on Broadway as Christine in The Phantom of the Opera and in Broadway national tours as Belle in Disney's Beauty and the Beast, Maria in West Side Story, and the Narrator in Joseph and the Amazing Technicolor Dreamcoat. She also appeared on television on Seinfeld, Guiding Light, and Third Watch and was a television news anchor and reporter in Virginia Beach and Norfolk, Virginia. The King's Academy is located on approximately 60 acres at the northeast corner of Belvedere Road and Sansbury's Way in Palm Beach County, Florida. Most of the campus was constructed in 2005 and consists of 16 buildings (Lower Elementary, Administration, Upper Elementary, High School Administration, High School Science, High School Education, M. Nelson Loveland Athletic Center, Elementary Music, Cafeteria, Rosemary Beaumont Library, Field House, Bus Garage/Maintenance, Events Center (completed in 2012), Full-Page Aquatic Center (completed in 2015), Page Family Center for Performing Arts (completed in 2017), and Boswell Science & Technology Center (completed in 2018)) encompassing approximately 225,000 square feet. In 2015, the school added Studio 70, a television broadcasting facility. The school also operates The King's Academy Preschool at remote locations in Boynton Beach, Greenacres, Loxahatchee, Palm Beach Gardens, and Royal Palm Beach, Florida; at the Boynton Beach Community Church, Church in the Palms’ Community Center, Trinity West Church, Cross Community Church, and Connect Church of Royal Palm, respectively. In 2010, The King's Academy established an internet-based school for middle and high school students called The King's Academy Online. The online program offers approximately 140 courses, with advanced placement courses and dual enrollment credits from Christian institutions including Indiana Wesleyan University and Taylor University. During the 2012-13 school year, two of The King's Academy Online's students, in 6th and 8th grades respectively, completed a 67,000 mile trip to all 50 American states and five of 10 Canadian provinces while enrolled. Their accomplishment was featured on the Today show. The King's Academy publishes student-produced elementary (EL) and high school (HS) yearbooks (both named The Sceptre) annually, monthly student-written newspapers (Roar, formerly The Lion Ledger and The Scroll) and semi-annual magazines (The Chronicle). During the school year, the school also issues a weekly online edition of TKA E-News. From 2014 to 2016, the school's yearbook program was named a Jostens National Yearbook Program of Excellence. ^ "The King's Academy homepage". Retrieved 19 October 2009. ^ "Roar: The Student News Site of The King's Academy". Retrieved 11 December 2016. ^ a b "The King's Academy History Page". Retrieved 4 February 2014. ^ "TKA History in Palm Beach Post". Retrieved 29 July 2014. ^ "Palm Beach County archives" (PDF). Retrieved 4 February 2014. ^ "King's Academy to open Clewiston satellite campus". ^ "The King's Academy Names Randal L. Martin New President". Retrieved 6 February 2016. ^ "King's Academy Recognized By National Program's Award". ^ a b "Palm Beach Post: The King's Academy Returns for Encore (January 17, 1989)". Retrieved 1 January 2017. ^ a b "TKA Production of Hunchback a Success". ^ Frost, Dr. Gene (2007). Learning from the Best: Growing Greatness in the Christian School. Grand Rapids, MI: Christian Schools International and Association of Christian Schools International. pp. 11, 15, 33–35, 42, 53–54, 56–58, 59–60, 117. ISBN 978-0-87463-160-9. ^ a b "The King's Academy Students Perform Disney's Hunchback of Notre Dame". ^ Frost, Dr. Gene (2014). Learning from the Best, Volume II: Growing Greatness that Endures in the Christian School. Colorado Springs, CO: Association of Christian Schools International. pp. 8, 12, 15, 17–18, 25, 29–32, 48, 87–88, 98. ISBN 978-1-58331-397-8. 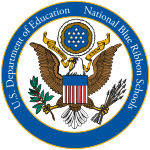 ^ "2014 National Blue Ribbon Schools" (PDF). Retrieved 30 September 2014. ^ "2014 National Blue Ribbon Schools Final Report" (PDF). Retrieved 30 September 2014. ^ "CBS 12: Evans Honors Alma Mater King's Academy with NFL's Golden Football". Retrieved 2 July 2016. ^ a b "The King's Academy Theatre Company Receives National Recognition". Business Development Board. Business Development Board of Palm Beach County. Retrieved 14 July 2017. ^ "CBS 12: King's Academy Dominates for a National Championship in Scottsdale". Retrieved 1 January 2017. ^ "Palm Beach Post: Trump inauguration- King's Academy choir, dancers will perform". Retrieved 11 January 2017. ^ a b "Congratulations TKA Competition Cheerleaders". Gym Like This!. Gym Like This!. Retrieved 14 July 2017. ^ "PB Post: Two PB County Schools Earn National Blue Ribbon Title". Retrieved 1 October 2014. ^ a b c "The King's Academy Academic Profile" (PDF). ^ "The King's Academy Accreditation". ^ "TKA Graduates 121 Seniors in Class of 2012". Retrieved 3 August 2014. ^ "TKA Academic Profile" (PDF). Retrieved 3 August 2014. ^ "AdvancEd: The King's Academy's Accreditation Report, page 6". Retrieved 3 August 2014. ^ "Town-Crier: TKA to Launch STEM Program Schoolwide". Retrieved 12 October 2015. ^ "Palm Beach Daily News: Former resident enriches science program at King's Academy". Retrieved 27 January 2019. ^ "The Palm Beach Post: Newsmakers: People on the move in Palm Beach County business, civics". Retrieved 5 July 2015. ^ "Senior Angie Lares Wins Harvard's Outstanding Attorney Award as The King's Academy Mock Trial Team Trained at Harvard University". Retrieved 1 November 2018. ^ "Blue Ribbon Elementary". Retrieved 8 July 2014. ^ "National Blue Ribbon Schools- The King's Academy". Retrieved 30 September 2014. ^ "TKA Elementary Curriculum". Retrieved 22 April 2015. ^ "TKA Lacrosse in Sun-Sentinel". Retrieved 7 March 2012. ^ "Florida High School Athletic Association". ^ "1993 Volleyball State Title". ^ "1994 Volleyball State Title". ^ "2006 Volleyball State Title". ^ "King's, Coral Glades repeat, while Stranahan wins first cheer state title". ^ "Post's All-Area boys golfer of the year: Andrew Kozan of King's Academy". Palm Beach Post. Palm Beach Post. Retrieved 14 July 2017. ^ "The King's Academy Lions - Sports Titles". ^ "Sun-Sentinel- Lehtinen Wins Shot for King's Academy". Sun-Sentinel. 7 May 1988. Retrieved 20 June 2017. ^ a b "Sun-Sentinel- King's Hallquist is Golden". Sun-Sentinel. 16 November 2001. Retrieved 20 June 2017. ^ "Palm Beach Post- All-Area Girls Track & Field". Palm Beach Post. 31 May 2003. Retrieved 20 June 2017. ^ "Palm Beach Post- Bradley Captures Fourth Straight State Title". Palm Beach Post. 29 April 2006. Retrieved 20 June 2017. ^ "Florida High School Athletic Association Track & Field Records". FHSAA. Retrieved 14 July 2017. ^ "State 1A Track and Field". Sun-Sentinel. Sun-Sentinel. Retrieved 14 July 2017. ^ a b "Palm Beach Post- King's Mercurio Wins State". Palm Beach Post. 26 April 2008. Retrieved 14 July 2017. ^ a b "Palm Beach Post- Williams Leads King's Academy". Palm Beach Post. 2 May 2009. Retrieved 14 July 2017. ^ Porter, Matt (26 April 2013). "Track and Field: King's Academy girls relay earns state gold". Palm Beach Post. Palm Beach Post. Retrieved 14 July 2017. ^ Wagner, Jodie (29 October 2015). "Golf: King's Academy's Kozan wins 1A state championship; American Heritage girls fourth". Palm Beach Post. Palm Beach Post. Retrieved 14 July 2017. ^ "Post's All-Area boys golfer of the year: Andrew Kozan of King's Academy". Palm Beach Post. Palm Beach Post. 1 January 2017. Retrieved 14 July 2017. ^ Fishman, Philip (20 June 2017). "King's Academy's Justin Bridgewater named All-Area Track Athlete of Year". Palm Beach Post. Palm Beach Post. Retrieved 14 July 2017. ^ Kotala, Carl (10 June 2017). "King's Academy's Justin Bridgewater: 2017 All-Palm Beach 2A-1A track Athlete of the Year". Sun-Sentinel. Sun-Sentinel. Retrieved 14 July 2017. ^ "ESPN West Palm Beach- View of Kahlert Stadium (King's Academy)". espnwestpalm.com. 17 October 2013. Retrieved 6 February 2015. ^ "USA Track & Field- The King's Academy 5K Course". Usatf.org. 3 July 2014. Retrieved 6 February 2015. ^ "Official Website of TKA Athletics". ^ a b "The King's Academy Opens Full-Page Aquatic Center". Retrieved 4 April 2015. ^ "Palm Beach Post- Unique On-Campus Facility Lies Ahead for King's Academy". pbgametime.com. 19 July 2010. Retrieved 6 February 2015. ^ a b "Aerial Map of The King's Academy". ^ "ABC News 20/20 Includes TKA's The Sound of Music". Retrieved 22 April 2015. ^ "Sound of Music Live- So Long, Farewell". Retrieved 22 April 2015. ^ "The King's Academy Theatre Company Stages The Light in the Piazza". ^ "TKA Students Perform Cinderella". Retrieved 25 August 2014. ^ "Palm Beach Post: West School News". Retrieved 25 August 2014. ^ "TKA Students Perform Beauty and the Beast". Retrieved 25 August 2014. ^ "TKA Students Perform Seussical". Retrieved 25 August 2014. ^ "TKA Students Perform Les Misérables". Retrieved 25 August 2014. ^ "Palm Beach Post: Our Town on Stage at The King's Academy". Retrieved 25 August 2014. ^ "TKA Students Perform Annie". Retrieved 25 August 2014. ^ "Palm Beach Post: The King's Academy to Stage Steel Magnolias". Retrieved 25 August 2014. ^ "TKA Students Perform The Hunchback of Notre Dame". Retrieved 25 August 2014. ^ a b "Palm Beach Post: The King's Academy Announces Theater Schedule". Retrieved 25 August 2014. ^ "TKA Students Perform The Wizard of Oz". Retrieved 25 August 2014. ^ "TKA Students Perform The Phantom of the Opera". Retrieved 25 August 2014. ^ "Showclix: The King's Academy The Sound of Music". Retrieved 29 September 2014. ^ "TKA Students Perform The Sound of Music". Retrieved 11 November 2014. ^ "TKA Students Perform Willy Wonka Jr". Retrieved 8 February 2015. ^ "MTI Shows: The King's Academy Willy Wonka Jr". Retrieved 21 October 2014. ^ "Palm Beach Post: Black Box Theatre Presents The Glass Menagerie". Retrieved 8 February 2015. ^ "Palm Beach Post: Black Box Theatre Presents Anne of Green Gables". Retrieved 8 February 2015. ^ "TKA Students Perform Anne of Green Gables". Retrieved 21 May 2015. ^ "Palm Beach Post: Titanic: The Musical at The King's Academy". Retrieved 13 March 2015. ^ "Palm Beach Post: Aida at The King's Academy". Retrieved 10 April 2015. ^ "TKA Students Perform Jekyll & Hyde". Retrieved 6 February 2016. ^ "TKA Students Perform A Christmas Carol". Retrieved 16 March 2016. ^ "TKA Students Perform Breakfast at Tiffany's". Retrieved 16 March 2016. ^ "Beatuy and the Beast- Live Musical Stage Performance". Retrieved 27 December 2017. ^ "White Christmas- Live Musical Stage Performance". Retrieved 4 March 2019. ^ "Peter and the Starcatcher- Live Stage Performance". Retrieved 18 March 2018. ^ "Oliver!- Live Musical Stage Performance". Retrieved 27 June 2018. ^ "Ghost the Musical-Live Musical Stage Performance". Retrieved 23 July 2018. ^ "Newsies- Live Musical Stage Performance". Retrieved 23 January 2019. ^ "2004 Florida Marching Band Championships Finals Recap" (PDF). ^ "2005 Florida Marching Band Championships Finals Recap" (PDF). ^ "2007 Florida Marching Band Championships Finals Recap" (PDF). ^ "2008 Florida Marching Band Championships Finals Recap" (PDF). ^ "2009 Florida Marching Band Championships Semifinals Recap" (PDF). ^ "2010 Florida Marching Band Championships Finals Recap" (PDF). ^ "2011 Florida Marching Band Championships Semifinals Recap" (PDF). ^ "2012 Florida Marching Band Championships Finals Recap" (PDF). ^ "2014 Florida Marching Band Championships Finals Recap" (PDF). ^ "Minnesota Vikings: 5 Things to Know About LB Emmanuel Lamur". Retrieved 15 March 2016. ^ "Washington Post: Diner Musical Finds the Film's Missing Pieces". ^ Davis, Darren (16 June 2017). "'Romy and Michele's High School Reunion' Should Have Been a Musical All Along". SagaCity Media. Seattle Met. Retrieved 14 July 2017. ^ "Tess Soltau at The Internet Movie Database". ^ Q & A: Evans learning from his friends The Seattle Times. ^ Heath Evans retirement announcement. Twitter. ^ "Gary Wallace at WAY-FM". ^ "Wally Speaks at TKA's 2014 Commencement". Retrieved 9 July 2014. ^ "UW-M Profile: Karl Shoemaker". Retrieved 15 June 2015. ^ "Professor Karl Shoemaker wins First Book Award". Retrieved 15 June 2015. ^ "C-SPAN: Karl B. Shoemaker". Retrieved 15 June 2015. ^ "Baptist Health System of Alabama Leadership". Retrieved 17 June 2015. ^ "Baptist Health System of Alabama Locations". Retrieved 17 June 2015. ^ "Birmingham Medical News: Ennis Named CMO". Retrieved 17 June 2015. ^ "Sgt. Philip Jones with US Marine Drum and Bugle Corp". Retrieved 13 February 2015. ^ "Huffington Post Kent Annan". ^ "Chaos and Grace in Slums of Earth". ^ "My Take Haiti Earthquake". ^ "Stormpulse: What Happens After A Site Goes From Free to Fee?". Retrieved 4 August 2014. ^ "About Riskpulse". Retrieved 4 August 2014. ^ "Florida State University: Rachel Rossin, Undergraduate Research and Creative Activity Award". Retrieved 18 June 2015. ^ "New Inc.: Rachel Rossin". Retrieved 18 June 2015. ^ "New York Times: Rachel Rossin's Virtual-Reality Installation in Bushwick". Retrieved 18 June 2015. ^ "President Donald J. Trump Announces Twelfth Wave of Judicial Nominees, Twelfth Wave of United States Attorneys, and Sixth Wave of United States Marshals". White House. 10 April 2018. Retrieved 10 April 2018. This article incorporates text from this source, which is in the public domain. ^ "Emin Toro bio". Covington & Burling. Retrieved 10 April 2018. ^ "Bring It USA: Christina Alessi". Retrieved 26 March 2015. ^ "PBAU: Sailfish Standout Christina Alessi Signs Professional Contract in Sweden". Retrieved 26 March 2015. ^ "Dominique L. Musselman, M.D." Retrieved 13 April 2016. ^ "D.J. Carter Biography". Retrieved 8 July 2016. ^ "Albert Harrison, Danielle Dingman Earn Long Course Duathlon National Titles". Team USA. USA Triathlon. 29 April 2017. Retrieved 14 July 2017. ^ "Palm Beach Post: Keith Allen to Replace Heath Nivens as King's Academy's Head Football Coach". Retrieved 24 March 2015. ^ "Football: Pahokee's Orson Walkes, King's Academy's Keith Allen earn coaching honors". Retrieved 14 December 2016. ^ "Amazon: Trusting for Tomorrow by Jennifer Arrington". Retrieved 24 March 2015. ^ "Florida Weekly: David Snyder Flying High at The King's Academy". Retrieved 24 March 2015. ^ "Fine Arts Personnel: David Snyder". Retrieved 24 March 2015. ^ "ESPN: King's Academy Tabs Brad Wilkerson New Head Baseball Coach". Retrieved 20 July 2014. ^ "USA Baseball Names Year-End Award Winners". Retrieved 24 March 2015. ^ "University of Florida: Our 12th President". Retrieved 24 March 2015. ^ "University of Florida: President Fuchs". Retrieved 24 March 2015. ^ "USC Gamecocks Football: Jonathan Martin Bio". Retrieved 24 March 2015. ^ "University of Kentucky Athletics: Jonathan Martin Bio". Retrieved 24 March 2015. ^ "History of The King's Academy". Retrieved 24 March 2015. ^ "Victory Drill Book". Retrieved 24 March 2015. ^ "Palm Beach Post: Broadway Veteran Joins Faculty at the King's Academy". Retrieved 24 March 2015. ^ "Sun-Sentinel: Broadway Star Takes on New Role at Private School". Retrieved 24 March 2015. ^ "Directions to The King's Academy". ^ "Palm Beach Post: The King's Academy Breaks Ground on $9.5 Million Performing Arts Center". Retrieved 12 October 2015. ^ "Sun-Sentinel: The King's Academy Opens Broadcasting Studio". Retrieved 4 February 2014. ^ "Palm Beach Post: The King's Academy Launches Broadcasting Studio". Retrieved 8 February 2014. ^ "PB County Health Dept Preschool License". Retrieved 28 August 2014. ^ "The King's Academy Preschool Homepage". Retrieved 21 May 2014. ^ "The King's Academy Launches Online Learning". Retrieved 3 March 2014. ^ "thatTripUSA Website". Retrieved 13 March 2014. ^ "thatTripUSA Press Release". Retrieved 13 March 2014. ^ "thatTripUSA on the Today Show". Retrieved 13 March 2014. ^ "The King's Academy Yearbooks". Retrieved 1 May 2015. ^ "TKA's The Lion Ledger" (PDF). Retrieved 1 May 2015. ^ "TKA's The Chronicle" (PDF). Retrieved 1 May 2015. ^ "TKA E-News" (PDF). Retrieved 1 May 2015. ^ "Jostens: National Yearbook Program of Excellence 2014". Retrieved 1 May 2015. ^ "Town-Crier: TKA Yearbook Staff Earns Major Award". Retrieved 1 May 2015. ^ "Palm Beach Post: The King's Academy Yearbook Program Wins Accolades". Retrieved 14 May 2015. This page was last edited on 23 April 2019, at 17:40 (UTC).